Ordinarily, I would use my February article to discuss the USDA cattle inventory report that typically comes out in late January or early February. However, due to the shutdown, that report is scheduled to come out at the end of the month, so we can have that discussion in March. With beef cow slaughter at such high levels, I do think we are starting to see early signs of beef cow herd growth slowing. But, I still look for a slight increase in beef cow numbers when the estimate comes out. In reality, anything between no change and a 1% increase would not surprise me. Calf markets really haven’t moved since December. A 550 lb steer remains in the low-mid $140’s, as can be seen in Figure 1. January 2019 prices were roughly $11 per cwt below 2018 levels. Note that February just includes one week of prices, but I did choose to include it in the chart. I still feel that this calf market can rally significantly, probably $20 per cwt, between now and spring grass. Cull cow markets also continue to struggle and I do think weather is a major reason due to stress and condition. Market reporters are indicating that a larger-than-usual share of cows are falling outside or normal grades that are reported. This means that a lot of producers are receiving prices for cull cows below what I typically report as a state average. It has been a while since we discussed cattle on feed numbers, so I thought it might be worth revisiting that for just a bit. 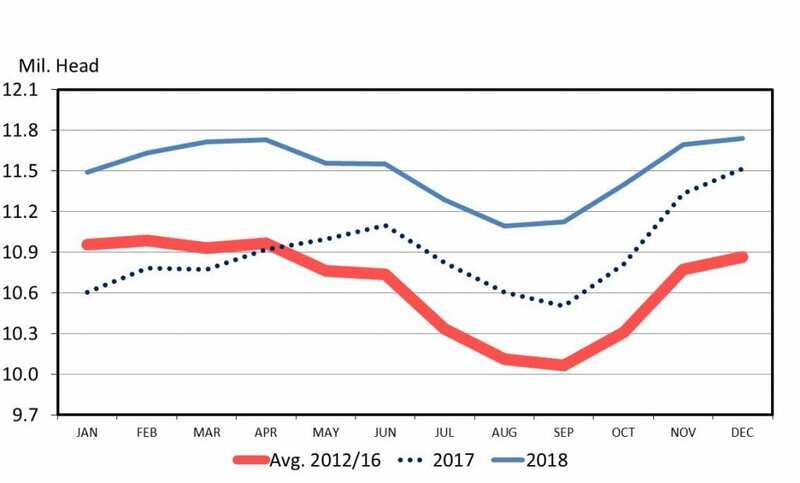 In January 2018, cattle on feed numbers were 8% above year ago levels. Much of that was due to the larger 2017 calf crop and early placements of cattle due to poor wheat grazing conditions last winter. 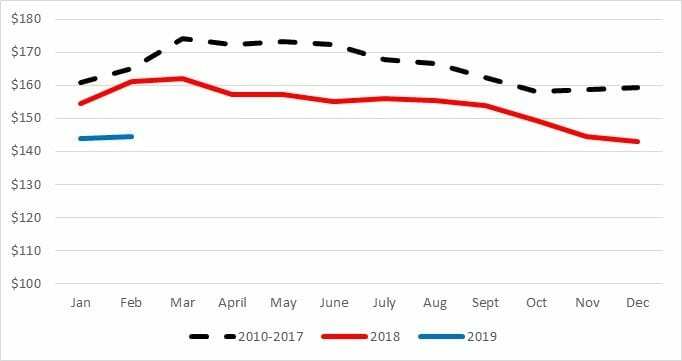 By the end of 2018, total on feed inventory was roughly 2% above year-ago levels. This is about what I would have expected given the size of our last calf crop. Put simply, current on feed numbers are probably a lot more representative of current conditions (see figure 2). Beef production will increase for 2019, but by a smaller percentage than we have seen in several years. Posted by Smith at 5:03am February 12, 2019 Posted in Economics. Bookmark the permalink.